We are just a few days after Halloween and haven’t gotten around to carving our pumpkin. It’s tough in Florida because once you carve the pumpkin, you might have two or three days of a jack-o-lantern before it turns black and rots. So, waiting until the last few days before Halloween is crucial. This year, we let the holiday pass us by without carving the thing so I made sure to have a back up plan for it. It just so happens that I was invited to a girls night at a friends house with an all-pumpkin theme. At the ladies-only shindig there was pumpkin turkey chili, pumpkin cheesecake, pumpkin spiced sangria, and we made pumpkin biscuits to go with the chili and roasted pumpkin seeds as a snack. We needed 1 1/2 cup of pumpkin puree for the biscuits, so onward with the home made kind! 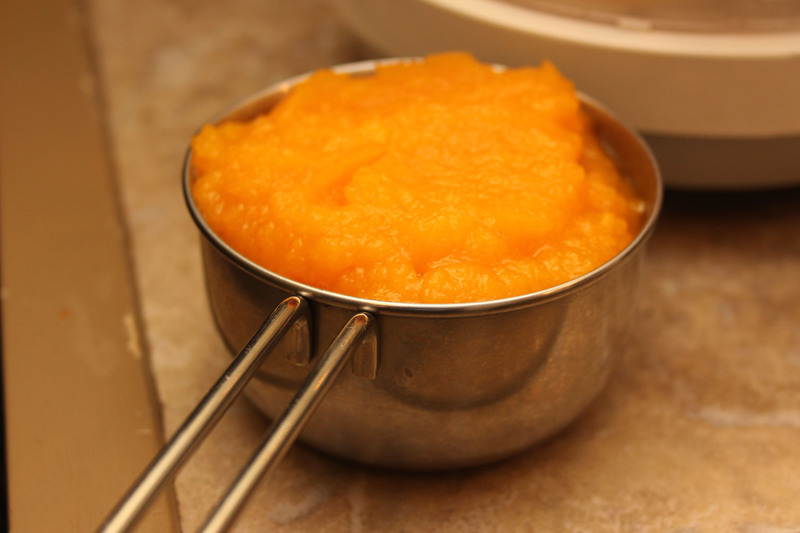 We ended up with 10 cups of pumpkin puree using a medium-large pumpkin. There are smaller pumpkins that might work better, but this is what we had already.